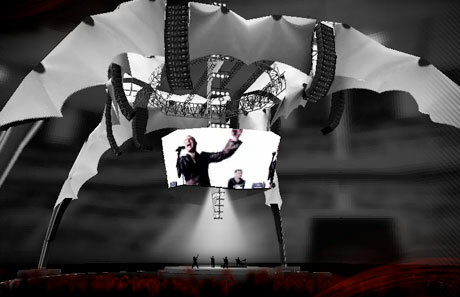 The results are in, and U2's mammoth 360° Tour was North America's highest grossing tour of 2009. All it took was millions upon millions of dollars in props, and a devastating blow to the environment. As NME points out, the Dublin-based rockers sold 1.3 million tickets in North America, raking in $129 million in Canadian dollars. Besides topping 2009's outings, the series of live dates also stand as the fifth most successful tour of all time. However, the tour, which will run throughout 2010, costs the band over $782,000 to put on every night. Regardless of costs, U2 have made a pretty penny off this tour. The news bodes particularly well for the band since they've been running a pseudo-tax evasion scheme since 2006.